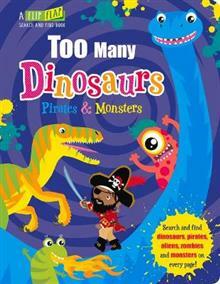 There are monsters hiding on every page of this search and find book. Just flip the flaps to find them taking over a city, sailing a pirate ship, running with zombies, roaring with dinosaurs and even visiting an alien planet! The fun rhyming words and the search and find activity... read full description below. There are monsters hiding on every page of this search and find book. Just flip the flaps to find them taking over a city, sailing a pirate ship, running with zombies, roaring with dinosaurs and even visiting an alien planet! The fun rhyming words and the search and find activity encourages word and picture association, which helps young children develop language and early reading skills. Can you find them all? Jenny Copper is a children's book editor and author who has been creating stories ever since she could read and write. She lives in the Suffolk countryside and her favorite authors are Terry Pratchett, Roald Dahl, and Jane Austen. Since graduating from art school 18 years ago, Carrie Hennon has worked as a graphic designer, illustrator, and art editor. Now an established author with three picture storybooks under her belt, Carrie's work has been published in many different languages and countries around the world.